mundane jane: Poke a stick in that puppy and give it to me to go. Poke a stick in that puppy and give it to me to go. I love corn dogs. I don't eat them as often as crunchy and delicious drive-through tacos, but every now and then, nothing will make me happy but a steaming hot battered wiener on a stick. For instance, I like a good corn dog on my birthday. And because this week has been a bit of a pisser, I think I'll look one up today on my lunch hour--sort of the working girl's alternative to the good-Lord-I-hope-this-gets-me-to-5 o'clock, two-martini lunch. No mustard. Who does this? Yet, every time I order one, I have to send the server back for the mustard. This one point is non-negotiable. A dry corn dog may as well be no corn dog at all. Come back and get it, cause I'm not eating it. Anything less than a steaming hot corn dog. Nobody likes a cold wiener. Okay, a dog will eat a cold wiener, as will a small child. And both will eat practically anything, provided it is found unguarded on the floor, so there you go. If your judgement is such that you will eat a weiner off the floor, then a cold weiner won't give you much pause. A wiener that is too large. There must be the correct ratio of dog-to-corn. Otherwise, what's the point? One might as well be eating naked wieners off the floor with the dogs and the little children and the people with questionable judgement. Anyone reminding me what comprises a wiener while I am in the process of eating one. There's no real reason to expound on this one, is there? Too much editorializing, and I run the risk of ruining my own corn dog. 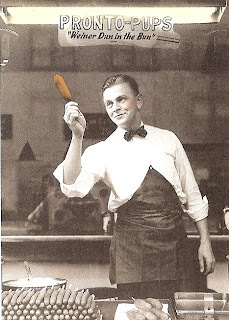 If you're thinking that a lot of things have to come together to result in the perfect corn dog, you're right. But when it works, it's well worth the trouble--and waiting for the server to fetch a packet of mustard. Please, please note their slogan. The extremely righteous music on this podcast is a remix of Feel My Pain Miss Jane, words, music, production, and performance by David Henderson. Corn dogs are the only real reason to go to the state fair. What about funnel cakes? Would you go to the fair for funnel cakes? As I was reading this I kept thinking , "My mom is talking about penises. Is my mom taking about penises?" From someone's who made that trip to the state fair with their two kids every year,nothing could get me to the state fair. The corn dogs are good and the funnel cakes are good but I can get either at any small town event in the state without having to walk five miles just to get to the gate at the state fair and walk five miles back to my car with two sleepy, cranky kids in tow. Stop it! Now I'm gonna have to come up with air fair to go back to Cedar Point in Sandusky Ohio to ride on the world's best and scariest roller coasters and then eat a Pronto Pup. Definitely in that order. And how I'll do this on a writer's salary is going to be the tricky part, as you well know, Boss. Nothing at all could get me to any state fair, but the Faulkner County Fair is just around the corner and I've had some really good corn dogs, mustard included without asking. So you won't have to wait much longer for your perfect corn dog Jane. That's nice. Not only do I have writers commenting on posts, but also using it as a platform to lobby for better pay. So noted, Lulu. How can you write a whole blog about corn dogs and never mention the little crunchy batter at the end of dog? That, sweet girl, is why you trudge through the imbalance of dog-to-corn ratio, and what allows the server to live when you're already on your way home only to find there is no mustard.